The Comodo Antispam Labs (CASL) team has identified a new malware attack targeted specifically at businesses and consumers who might use WhatsApp, a multi-platform mobile phone messaging service that uses your phone’s Internet connection to chat with and call other WhatsApp users. As part of a random phishing campaign, cybercriminals are sending fake emails representing the information as official WhatsApp content to spread malware when the “message” is clicked on. Each subject ends with a set of random characters like ‘xgod’ or ‘Ydkpda’. These are probably used for encoding some data, to identify the recipient(s). The attachment contains a compressed (zip) file, in which a malware executable resides. The malware is a variant of the “Nivdort” family. The malware usually replicates itself into different system folders, adding itself into an auto-run in the computer’s registry. Once the zip file in the email is opened and executed, the malware is released onto computers. 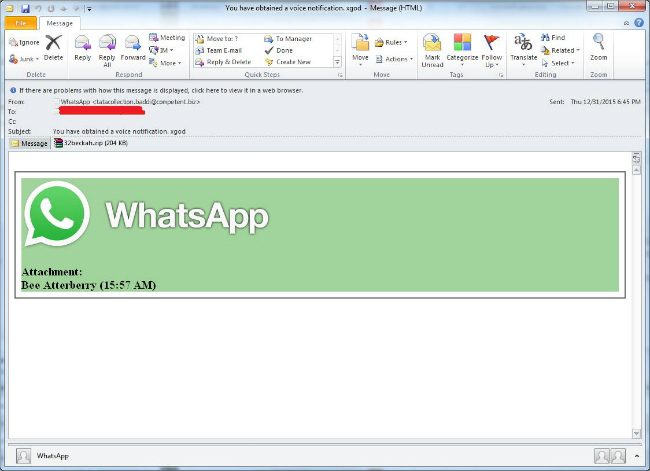 The Comodo Antispam Labs team identified the WhatsApp email through IP, domain and URL analysis. The Comodo Antispam Labs team is made up of more than 40 IT security professionals, ethical hackers, computer scientists and engineers, all full time Comodo employees, analyzing and filtering spam, phishing and malware from across the globe. With offices in the U.S., Turkey, Ukraine, the Philippines and India, the CASL team analyzes more than 1 million potential pieces of phishing, spam or other malicious/unwanted emails per day, using the insights and findings to secure and protect its current customer base and the at-large public, enterprise and Internet community.